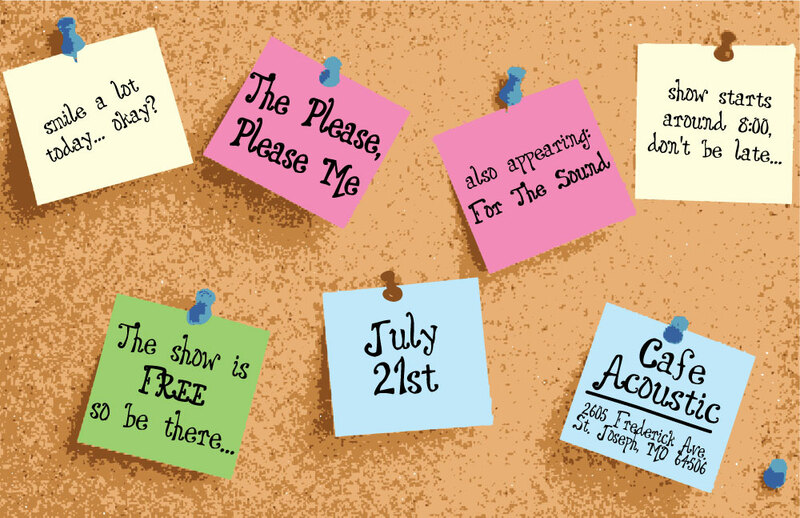 The Please Please Me led by Jessie Torrisi plays sultry pop songs that will break your heart and make you fall back in love all at once. The unique and elaborate drum setup is only accented by Torrisi’s drumming on her log on a few songs. A slick looking cello and female cellist holds the sound together and gives the songs a smooth feel. The hook heavy tunes are pleasing to the ear and leave you in a better mood after hearing them. Listen for songs from their pretty stellar new 5 song EP that was just released. The best track is likely “All Danced Out” while “Dreamin'” has a… well… dreamy quality to it. The poster above was inspired by a pop number from the EP named “She Leaves Notes” that will hopefully crack the setlist again. The centerpiece of every Please, Please Me’s setlist is “Hungry Like Me” that is simple one of the best pop song you will ever hear. what else are you going to do on a Sunday night? This entry was posted in Coming Soon and tagged Austin, Cafe Acoustic, Coming Soon, For The Sound, Jessie Torrisi, Please Please Me, poster, Shake A Little Harder, She Leaves Notes, Sunday, Texas, Zale Bledsoe. Bookmark the permalink.